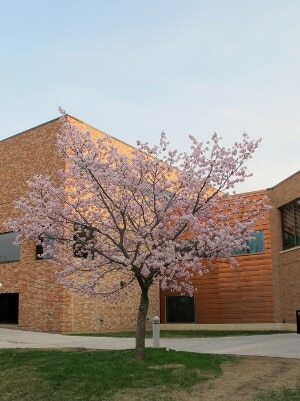 Some of you may be familiar with this recently introduced tree, Spring Wonder. It is the first cherry tree that is hardy enough to withstand our long, cold winters. The tree may be new to the market, but I’ve known about this tree for years. Its journey from seedling to production and distribution is one of luck, determination and appreciation. 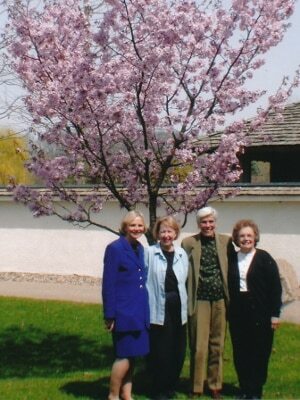 Growing up as the daughter of one of the founding co-chairs of the Normandale Japanese Garden, it has been a part of my family for almost fifty years. It started out as a Bloomington Affiliated Garden Club project to plant trees in Bloomington parks. The result was submitted to the Lady Bird Johnson “Beautify America” contest and was awarded $500.00. The Bloomington Garden Clubs wanted to do something special with the money and the state was developing a junior college in Bloomington. So the Garden Clubs approached the newly named president of the junior college with an idea. In the end they were given about two acres of mostly swamp land to create a Japanese garden. Only the hill to the south was solid ground. The newly formed committee now had the task of creating a Japanese garden. Several members of the Japanese American community joined the committee and in 1969 Takao Watanabe, a landscape architect for the Tokyo Metropolitan Government, designed the garden. Soldiers, who had been stationed at Camp Savage during World War II, wanted to show their appreciation and made a significant donation in support of the garden. Then in 1981, Watanabe-san met Roland Jefferson, a botanist at the National Arboretum in Washington DC and encouraged him to visit Minnesota. Mr. Jefferson loved the garden but thought that it should have cherry trees. 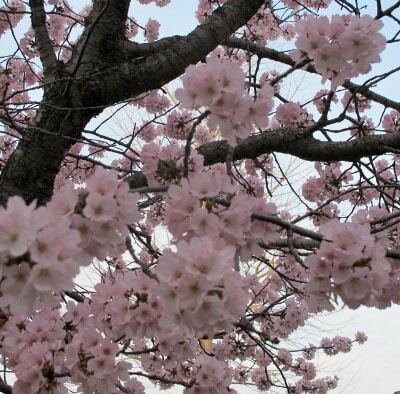 (The original plan had called for cherry trees but they could not survive our cold climate.) As luck would have it, Mr. Jefferson was very good at plant exploration and he knew what to do. After several years Mr. Jefferson followed up on his brood of seedlings. Of those that had survived at the various universities, arboretums or nurseries none of them were as wonderful as the tree that grew at the little known Normandale Japanese Garden. It had a cherry tree to be proud of. The committee now had a new challenge on its hands, should it see if it could bring this tree to the public. It was an arduous process that took many years and many people. Mr. Jefferson, the University of Minnesota Arboretum, Bailey’s Nurseries all contributed but mostly it took the determination of committee member, Lynn Friefeld. Finally in 2010, “Spring Wonder, Sargeant Cherry Tree, Prunus sargentii, Hokkaido Normandale” was introduced to the nursery market. It is a wonderful ornamental tree that’s made quite a journey. Having traveled half-way around the world, it is finally available to more gardeners who are planting trees to improve parks. Having been nurtured by people who wanted it to be part of a Japanese garden in Minnesota it will now continue its journey as a tree that can be planted in many more parks and gardens around the world. MMC at Como recently planted Spring Wonder in the redesign of their Japanese Garden.